Cartyas, or Cȧrq́ax, is a fictional country that is part of the Dutch geofictive interaction project "Atlantis". This website will be expanded in the course of time, so some links may not yet be operational. Cartyas is an almost entirely landlocked country on the island of Borealia. 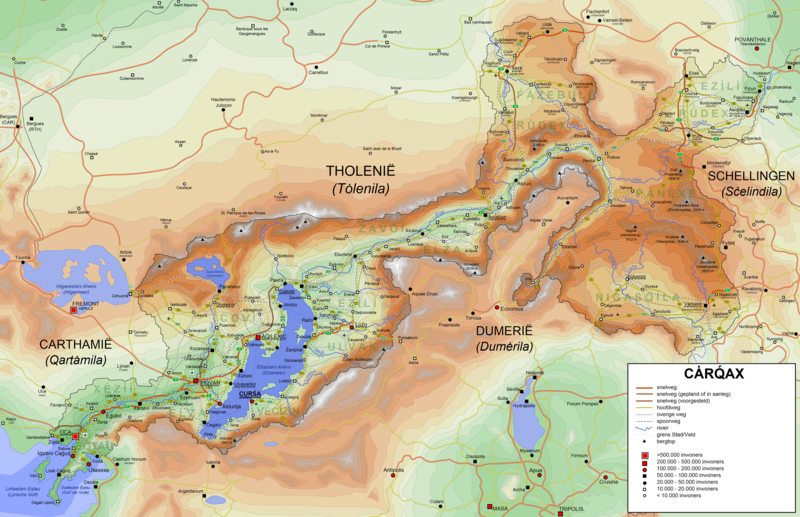 Most of its borders are formed by high mountains that cut it off from its neighbouring countries: Carthamia in the west, Tholenia in the north, Schellingen in the east and Dumeria in the south. The inhabitants of Cartyas are descendants of European immigrants who crossed the Atlantic and ended up in Borealia. The Dumerians, who arrived later, eventually pushed the Cartians in the mounainous area where they currently live. For many centuries the Cartians remained isolated within their mountains until the country was opened up after a political and cultural revolution in the second half of the 19th century. The mostly agrarian society industrialised at a large speed, but due to continuing economic downfall in the second half of the 20th century, Cartyas is currently one of the poorer countries in the region. National Anthem: "Ovovȧtecunȯ Tahu̇nś X́ahalȧ, Ovovȧtecunȯ X́ahu̇leś Cȧrq́ax" - May the Gods protect the governor, may the governor protect Cartyas. GDP: $24.75 billion ($3,997 per capita) (2017). Currency: 1 Velurq́i (CQV) = 16 Markexe; CQV 1 ≈ € 0.55. Motorways: there are six officially defined controlled-access highways, designated by V1 to V6. In addition, there are some bypasses and (parts of) city rings that have the character of controlled-access highways, but aren't listed as such (yet). Main roads: main roads are designated with two digit numbers only. Other roads: smaller roads are designated with three digit numbers. Maximum speed: 90 km/h on motorways (70 in case of precipitation and bad road), 70 km/h on main and other roads, 50 km/h in urban areas). Railways: Although Cartyas has a large amount of railway tracks, many of these aren't used anymore and/or are severely deteriorated. Airports: there is an International Airport near Hov́an; regional airports and airfields can be found near Oca, Curśa, Lu̇źo, İzėliśuldė, Xiṕ, Xėzė, Ȧsıqtau, Egixulś and Vȧrśalek. Ferries: between Oca and the island of İrq́in and between several settlements around Lake Elzha. Main local numbers: (0)10 Curśa, (0)20 Hov́an, (0)21 Lu̇źo, (0)23 Ėǵu̇bȯ, (0)24 Xėlurq́ȧ, (0)25 Asćėv́un, (0)30 Oca, (0)40 Aq́ılexic, (0)50 Varśalek, (0)60 Ȧsıqtau, 0700 general alarm number (can only be called from within Cartyas). Official name: Cȧrq́ax (English: Cartyas, Dutch: Kartjas, German: Kartschaß, French: Cartiasse, Russian: Картьяс. Area: 26,720 km2 (bigger than Macedonia, smaller than Haiti). Regime: decentralised republic with bottom-up democracy (unofficial designation). Life expectancy: 74.8 years (male), 78.0 years (female). 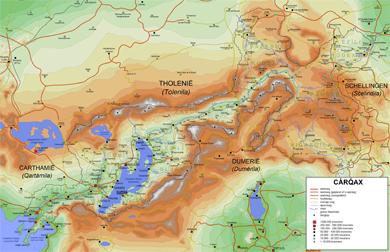 Languages: Cartian (Caru̇h́), official; Nagaskian and German dialects and creoles, unofficial. Ethnic groups: Cartians (90%), Rudentians and other German speaking minorities (3%), Nagaskians (2%), other (5%). Religions: Nagaskism (93%), Christianity (5%), Judaeism (1%). Universities: Hov́an (1794), Oca (1938). Names: Cartians don't have family names. Persons are indicated with their first names, followed by a patronym, meaning 'son of' or 'daughter of'. A man's patronym is created by adding -me to his father's first name; a woman's patronym by adding -p to her father's first name. As Cartian names and the gender they are used for are often unfamiliar to foreigners, the patronym can be used to determine if a person you haven't seen before is male or female. Creating a patronym using the mother's name (i.e. a matronym) is extremely rare and used only when the father's name is unknown or when the mother's social status is more important than the father's. Cartians are introduced with these two names, but after that, it is polite to continue addressing them by the first name, unless a person has an important status, in which case you can proceed to call him or her by his or her full name, or use u̇n (sir) or ṕozim (ma'am) in combination with the first name only. Using these words in combination with someone's full name should be avoided however, as this will be interpreted as sarcastic and therefore extremely impolite. Capital: Curśa (ceremonial capital, governor's residence). Seat of the government: Hov́an. Seat of the Constitutional Court: Xėlurq́ȧ. Administrative division: 77 Cėv́ixe ('Towns') and Remixe ('Fields'), which can be freely combined to Ȧshulėxe ('Shires'); currently 74 of the Towns and Fields form nine Shires; three Fields have chosen not to join a Shire. Head of state: X́ahalȧ (governor) Lȯtar Hėriberteme, since 2014. The X́ahalȧ is appointed for life by the members of the parliament. Parliament: Źu̇x́o ('the Thing'), which convenes annually in May or June to discuss the current affairs, and otherwise whenever necessary. The members are representatives of the governing councils of the Shires and of the Towns and Fields that don't belong to a Shire. Head of government: V́iv́isćeni Minister (prime minister) Alecsander Ehohome, since 2018. Minister of foreign affairs: Ṕaǵon Oluhup (f), since 2015.
International organisations: Cartyas is a member of FAO, IAEA, IBRD, ICAO, ICC, IDA, IFAD, IFRCS, IMF, IMO, IOC, OSCE, UN, UNCTAD, UNESCO, WHO, WTO. The judges of the Constitutional Court are appointed for life by the governor; the other judges are appointed by the government for a three year term, which is once renewable for three years and after that for one year. For the most part, Cartyas lies around the river Ėlźa in the Fugesian mountain range. Towards the southwest, the country is low and ends in a small coastal area and a small island off the coast. Towards Carthamia, the countryside is hilly, but the borders with Tholenia, Schellingen and Dumeria are more mountainous. Largest lake: Ėlźasćeni Ahėv́o (Lake Elzha). Climate: temperate; cool, not particularly wet winters and dry, hot summers in the southwest, colder towards the northeast and in the mountains.